I sat down in the comfy, rocking chair at the edge of the meeting area. The class of first graders gathered around me, anxious to hear the story I would read aloud. 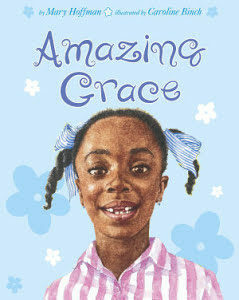 Upon seeing the cover of the book, Amazing Grace by Mary Hoffman, illustrated by Caroline Binch, a boy asked: “Is that the girl who went into the white schools?” While the illustration slightly resembles those by George Ford in The Story of Ruby Bridges by Robert Cole, I suspect the real reason for his question is that he is not used to reading books with main characters who are African American. Characters who are like the reader serve as a mirror of their lives while those who are different offer a window into the lives and customs of others. My decision to read aloud Amazing Grace for this demonstration lesson was intentional. I work in a district where the population is predominantly Caucasian so I share books with characters of diverse backgrounds whenever I can. For those who do not know it, Amazing Grace tells the story of a girl who loves acting. She has an amazing imagination so naturally, when her teacher announces that the class will be performing the play, Peter Pan, she jumps at the chance to play Peter. Unfortunately, two classmates tell her she can’t, one because she is a girl, the other because she is black. Some students connected this story to what they had learned about racial segregation. I shared that the story could take place now which facilitated a discussion about the limits that some people put on one another. It is clear that the students’ teacher has built a community of learners accustomed to discussing ideas (also evidenced by how beautifully they turn and talk). The students felt safe to ask questions and share their thoughts. As a literacy coach, I realized that my next step is to make sure classrooms have books that provide windows into the lives of others. Following Burkins and Yaris’ lead, I will look over our libraries and ask:”How much racial, socioeconomic, gender and age diversity is presented in the texts I share with students?” p. 38. Fortunately, we have gorgeous classroom libraries curated by Lucy Calkins and her team at Teacher’s College due to arrive this summer which are filled with culturally diverse books. My work will be to highlight them to teachers and students and use them in instructional contexts such as read aloud to encourage rich discussion. I also think that it is important that not every book with diverse characters be about Civil Rights. 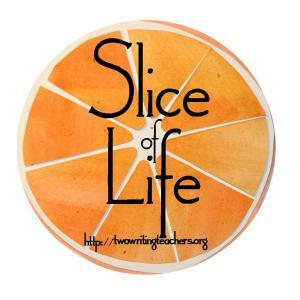 Students need to see characters who may provide a window in appearance and culture but, like Grace, whose life lessons apply to all readers and therefore, make them a mirror of the reader’s life. I really appreciated this post! 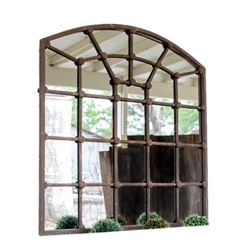 I also love this idea of books that initially appear to be a window turning out to actually be a mirror. I think that’s one of the most powerful repeated lessons we can teach through literature. I think that’s how empathy grows. And thanks, too, for the comment about the importance of making sure every single diverse book isn’t about the struggle. Literally every book about black people that my black son read in school was about slavery or Civil Rights. Not ok! Thanks for this post. I’m trying to live this in my coaching life, as well, and appreciate the honesty and resources in your story. While there is sometimes pushback from teachers, I’m standing firm on the benefits of “windows and mirrors” for all kids. Yes to windows and mirrors in the curriculum. I especially like “I also think that it is important that not every book with diverse characters be about Civil Rights.“ So absolutely true! I used to get embarrassed when books presented Asians with slanty eyes celebrating Asian holidays. I want to read about compelling characters who happen to be Asian.